Ed. note: Excellent work by the Capitol Police officers, who were forced by federal prosecutors yesterday to remove disabled protestors. Dealing with protestors is always a challenge, but when they are in wheelchairs and suffering from serious health problems, it can be extremely difficult. 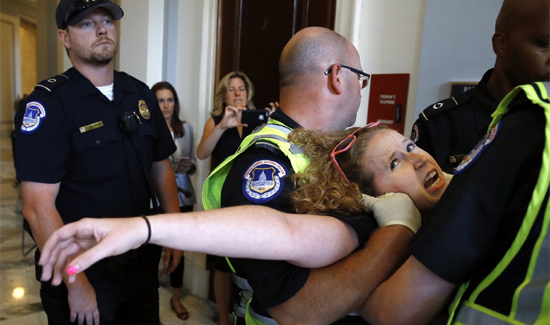 U.S. Capitol Police forcibly removed demonstrators and disability advocates — some of whom were in wheelchairs — protesting the Senate’s proposed health care bill outside of Majority Leader Mitch McConnell’s office Thursday. Capitol Police said they arrested 43 protesters for refusing to end the demonstration. Organized by ADAPT, a disability rights organization, the protest targeted the bill’s significant cuts to Medicaid for low-income Americans.